In recent times, reverse osmosis water system has become widely popular among thousands of people for producing high-quality water. This water system usually comes with a three or five-stage filtration system and it also employs the advanced filtration technologies to make sure that people get pure water easily. With that said, reverse osmosis water system is capable of removing various kinds of uncontaminated elements. In addition to this, this system will filter out the bad odors or any unpleasant taste from water as well. In fact, reverse osmosis system utilizes the Ultraviolet rays for ensuring proper sanitization of water and it will retain all the healthy minerals of water as well. Generally, the RO water system is being heavily utilized in water filtration plants. Also, people are using this water system for domestic water filtration, especially the small-sized RO systems. To add to this fact, these small-sized reverse osmosis systems are suitable for home use as they come with 3-stage or 5-stage filtration process. If you investment in reverse osmosis water system, it will be a very good investment for you. However, you have to ensure that the unit is maintained properly since the filter cartridges and membranes are required to change and clean on a time-to-time basis. 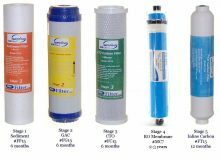 How to Change the Filter Cartridges of an RO Filter System? Until now, you have only known that reverse osmosis is a great addition to your home and this system needs proper maintenance. So, we shall now move forward and get to know the steps to change the filter cartridges of an RO filter system. First of all, you will turn off the external water supply to the reverse osmosis system. Secondly, you will open the end faucet of the system to release the pressure. Also, allow the system to stay for a while. Now, while adopting a counter-clockwise direction, you will start opening the filter tanks. This opening process can be performed by hands, but you can take the help of a filter wrench, provided that the filters are too tight to open. Next up, while keeping the filter tanks in a vertical position, you will slide out the old filter cartridges. If needed, you can sanitize the filter tanks. Keep in mind that the sanitization must be performed in every two years. At this moment, you will include the new filter cartridges and be cautious of not to contaminate the cartridges with any dirt or waste materials. Also, you would leave the RO membrane in the filter tank and remove all the filter tanks while using the above process, thus insert the new filter cartridges. Since you have added new cartridges to the system, you will now screw back the filter tanks whilst rotating them by a clockwise direction. Finally, you will test out the system by allow water to pass through the system. Bear in mind that, the initial water coming from the system is not safe. So, don’t drink it. To conclude, I would say that changing the filter cartridges of an RO System requires you to purchase new filter cartridges. But always remember that the cartridges that you will be buying must match the model number of your system. After buying the new cartridges, just follow the above steps and you will be able to change the cartridges of your RO system easily. I used to volunteer in the husbandry department of an aquarium where they had me cleaning water filters for their treatment systems. We had to make sure that each section and tank had the right chemical balances for the health of the fish. I never had to clean the RO system, but maybe that was because the filters didn’t need to be changed as often. You said that the sanitizing should be done every two years, but is that the same time frame for changing the filter? Waterfiltersystemguide.com is a participant in the Amazon Services LLC Associates Program, an affiliate advertising program designed to provide a means for sites to earn advertising fees by advertising and linking to Amazon.com. Additionally, Waterfiltersystemguide.com participates in various other affiliate programs, and we sometimes get a commission through purchases made through our links.